Although it’s not given as much attention as other factors, the quality of the air indoors makes an impact on everyone’s health. Most people spend far more time inside their homes than anywhere else. Improving indoor air quality is a big step toward improving your family’s overall health and wellness. Not introducing pollutants into your home is one effective method for improving indoor air quality. Volatile organic compounds (VOCs) contribute to respiratory irritation and in extreme situations, organ failure and cancer. This is a long list, but fortunately, there are non-toxic alternatives to most of these. Buy perfume-free soaps and choose dry cleaners who use environmentally-safe methods and products. Look for home remodeling products like paints and adhesives that don’t have VOCs. Check the labels for their compliance status. It’s tough to avoid VOCs when buying furniture or cabinets. If you can, let them air out before bringing them inside. Temperatures over 70 degrees Fahrenheit promote the evaporation of the VOCs. As products age, they have fewer VOCs to disperse. Homes need fresh air throughout the year, but it’s hard to do so in an energy-efficient way when the weather doesn’t cooperate. Energy recovery ventilators (ERVs) and heat recovery ventilators (HRVs) provide balanced ventilation in the most energy-efficient way possible. One of its two fans pulls stale, indoor air out while the other pulls fresh air inside. The core for the HRV or ERV extracts the energy from the outgoing air and puts into the incoming air. An ERV will also remove the humidity from the incoming air, which makes it a valuable appliance in humid climates. HRVs and ERVs can blow air directly into a room or be combined with an HVAC system to blow through the ductwork, which introduces fresh air to every room in the home. 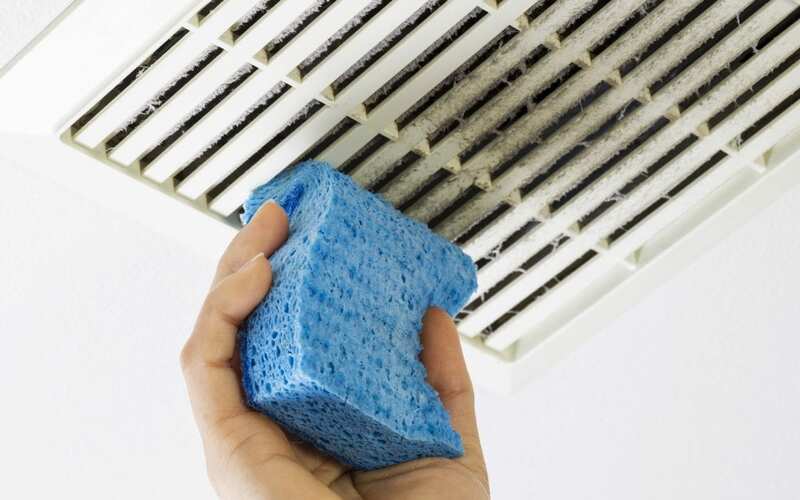 Simply cleaning your home on a regular basis not only makes it a more pleasant place to live, but works wonders for improving indoor air quality. Dust hard-to-reach surfaces like the ceiling fan blades and air vents to keep dust particles from blowing around the room. Clean starting from the top and work your way down to the floors. No matter if you have carpet or hardwood, keeping the floors clean matters when improving indoor air quality. Dirty floors kick dust and allergens up into the air. Dusting and vacuuming help with indoor air quality, but they may not be enough to prevent some threats like mold. Your HVAC system can handle mold growth in two ways. It can control humidity levels and eliminate the possibility of mold growth. Besides using a central air conditioner for humidity control, you can also use a whole-house dehumidifier to remove the excess moisture from the air. UV (ultraviolet) lights tucked inside the ductwork or the air handler do a lot for improving indoor air quality. They alter the DNA of the mold spores and other organic particles that pass by them. After exposure to UV lights, the particles won’t be able to reproduce. UV lights are effective against VOCs, bacteria, and viruses, too. No matter where you live, radon is a threat to indoor air quality. If your goal is improving indoor air quality and your home has not been tested for radon, now is the time. If the radon level is under 4 picocuries/liter, the EPA says that it’s a safe level. Anything higher should be addressed by having a radon mitigation system installed. Improving indoor air quality does require some effort and sometimes an investment, but you will enjoy a noticeable difference and improve the long-term health of your family. Appalachian Inspection Services provides Western North Carolina with home inspection services and radon testing. Contact us to schedule your appointment.